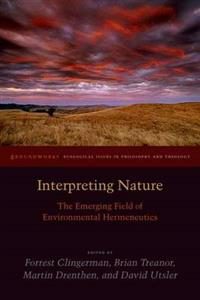 Interpreting nature (edited by Forrest Clingerman, Brian Treanor, Martin Drenthen, and David Utsler) sets out to establishing environmental hermeneutics as a new field at the intersection of environmental issues and philosophical hermeneutics. The essays explore hermeneutical approaches to the concept of interpretation and the environment, in the field of environmental philosophy. One of the main concerns in the volume is how our understanding of the environment shapes both ourselves and our actions in nature. A key goal is to examine the complexity of these reflexive encounters in order to understand our interpretive and ethical relationships with our environments. The book has four sections that sort the contributions thematically. Part 1 includes essays on “Interpretation and the Task of Thinking Hermeneutically”. The title of part 2 is “Situating the Self, and of part 3 is “Narrativity and Image”. Part 4 is entitled “Environments, Place, and the Experience of Time”. Most essays in these sections discuss texts by Heidegger, Gadamer, Habermas and Ricoeur, making the point that our engagements with the surroundings are dialogical rather than binary in nature. In Nathan Bell and David Utsler’s contributions, this insight sparks explorations into what constitutes an environmental identity. The answer, they conclude, is to be found in Ricoeur, in a complex narrative form, inspired by his “hermeneutics of the self”. For both Bell and Utsler, the question of selfhood has normative aspects in relation to the environment and the present-day environmental crisis. The volume provides clarifying insights into human understanding and engagement with nature, as the essay authors engage in hermeneutical discussions regarding our relationship with nature. In the introductory chapter, the editors provide an overview of approaches to environmental hermeneutics. Such an approach is justified since “[e]nvironmental hermeneutics can critically mediate between different disciplinary interpretations so as to suggest a fuller and more robust understanding of environments” (p. 4). With the many narratives related to the environment included in the essays, the weighing and mediating of different interpretations is an issue that needs to be discussed. One important question that could be explored in greater depth in the volume is the role scientific knowledge plays in the ways we interpret nature. This seems especially crucial when Utsler, in his essay “Exporations in Environmental Identity”, stresses the healing and therapeutic capacity of nature as a foundational marker in environmental identity. The difference in nature as a therapeutic and a recreational environment is something that I would like to see addressed in relation to the environmental identities Utsler construes. The hermeneutical approach to the environment could be relevant to most, if not all, of the projects in the NaChiLit-research group, particularly the chapters that explore anthropocentric views of nature. Christina Gschwandtner, in “Might Nature Be Interpreted as a “Saturated Phenomenon””, suggests that anthropocentrism cannot be avoided as long as “it is the human who continues to speak and to articulate even the biocentric or ecocentric position” (pp. 99, 100). Brian Treanor, in “Narrative and Nature: Appreciating and Understanding the Nonhuman World”, tries to deal with this issue by highlighting usefulness of the hermeneutical understanding of narrative as a way of giving form to an interpretation that is different from science (theoria) and practice (praxis) (p. 198). The focus on narrative constructions in interpreting nature, highlights the need to consider personal experiences and literary and cultural mediations of natural environments, as well as scientific knowledge, in order to establish a philosophy that includes perspectives on environmental ethics and the construction of environmental identities.